Can you imagine, say in the 70s or 80s, that this would be a "normal" scene in a public park in 2010? Remember Segways? Those things that Dean Kamen and company came up with after a brainstorming session where the question was, "How can we outdo the idiot bicyclist? Surely there's something we can build that is more dangerous to the public." 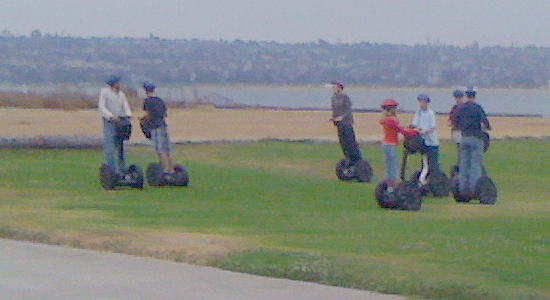 I suspect somebody tilted the country and all the Segways rolled over to San Diego, where the tourists now pay big bucks to rent 'em. It's weird. Good luck if you are unlucky enough to encounter a whole herd of 'em barreling towards you at full speed on a narrow sidewalk. They do not yield to pedestrians.